The VSP Power Supply series uses modern switch mode technology to produce high-power, low-noise switching supplies that cost around twenty five percent less than linear supplies with the same power. The VSP series offers as much as 1.2 kilowatts in a 19 inch rack mountable chassis that measures just 1U (1.75 inches) in height. 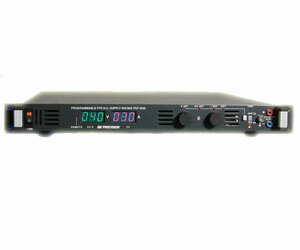 The VSP series power supplies can provide precise output voltage control via manual tuning utilizing front panel mounted ten-turn potentiometers or by remote control from an RS 232 interface (provided on standard VSP models) or by GPIB interface (add "GPIB" to the model number for a VSP with GPIB interface instead of RS 232). All models have remote sensing capabilities to automatically maintain desired voltage levels at the load.